I hope that u heard the last debate at UK between Danial pipes and other thinker. i see that Muslims have left the media for those people. How Muslims find some sort of effective propaganda to change this dark image. i wanna tell u that iam so worried . Daniel Pipes is a clever polemist but above all he is a liar. Many of the facts and statements he mentioned and made were wrong. 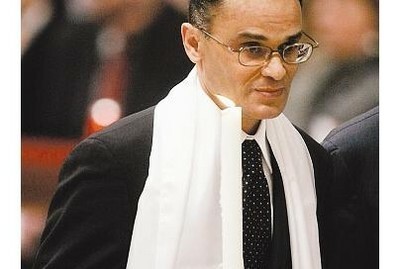 Pope Benedict XVI personally baptized Magdi Allam, converting him to the Catholic religion. Mar. 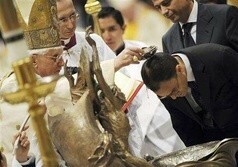 22, 2008 update: Pope Benedict XVI personally baptized Magdi Allam today, converting him to the Catholic religion. The ceremony took place in a nighttime service at St. Peter's Basilica on the eve of Easter Sunday; it consisted of the pope pouring holy water over Allam's head and reciting a prayer over him. The event was prominently featured on Vatican television and received world-wide coverage. Comments: (1) This development provides yet another proof that Magdi Allam was not a Christian in January 2007, when I mentioned him in my London talk. (2) It prompts me to ask Tariq Ramadan: "In light of Magdi Allam's public conversion to Christianity, do you still maintain that he was all along a Christian? If so, please explain the logic of your claim." I won't hold my breath awaiting a reply. Magdi Allam at the baptism ceremony. Mar. 23, 2008 update: Allam provides an explanation for his conversion in "Approdo di un lungo cammino Decisivo l'incontro con il Papa." Nov. 30, 2008 update: Allam founded a new political party, Protagonisti per l'Europa Cristiana ("Protagonists for Christian Europe") to enter candidates in next year's European Union elections. According to the Associated Press, he said the party "would work to defend Europe's Christian values, which he sees threatened by secularism and moral relativism. He said his new party would be open to people of all faiths and would be close to the conservative European People's Party." June 28, 2009 update: Over two years after the event, I just learned that Ramadan's statement about me at the London conference is available on the internet at http://ikbis.com/imad/shot/10559. Oct 8, 2010 update: Ramadan continues his lies about me, telling an audience at Northwestern University today in a speech titled "What I Believe" (at 53:05 on the recording) that "If you listen to Daniel Pipes, the only moderate Muslims are the ex-Muslims, this is what he says." Comments: (1) Given my slogan that "Radical Islam is the problem, moderate Islam is the answer," Ramadan's distortion of my analysis is a profound one. (2) Obviously, I challenge him to document his statement. Again, I won't be holding my breath. Mar. 25, 2013 update: Magdi Allam has announced that he is leaving the Catholic Church (but remaining a Christian) because of its supine response to the Islamic threat.